I don't know about you but I love Daim bars, originating from Sweden to me they are the perfect pick me up, so when I was asked if I would like to try the Daim dessert cake I jumped at the chance. Daim are just another great thing to come from Sweden, we had Abba and of course Ikea, all successful in their own right. This delectable Swedish frozen dessert only takes 30 minutes to defrost and is perfect on its own or topped with fruit. The product does not use flour and is therefore gluten free and it has the same gorgeous taste of the Daim bar but in cake form. An absolute stand by dessert for unexpected visitors and available in the two following flavours, available in leading supermarkets and Ikea. To celebrate the 15th anniversary of Almondy Daim I have a smorgasbord of Almondy goodies to offer as a competition prize. 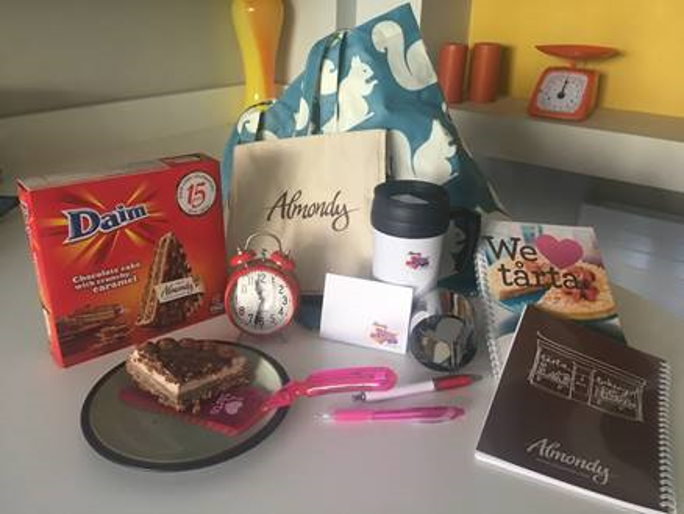 As well as a stylish Anorak shopping bag, a Newgate Alarm Clock, a thermal coffee mug, cake slice and notepads the prize bundle is worth around £30 and includes four Almondy Daim cakes. Whipped cream an banana sauce! Fresh whipped cream and maltesers! Strawberries and cream :- Delicious! Salted caramel sauce, and maybe crumble a flake on! Ice cream which I love. Devonshire clotted cream. 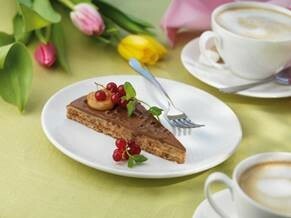 Nothing more required as that would make for the perfect dessert. Oh wow, I haven't seen a Daim bar in years! I would too mine with clotted cream!!!! Yummy! some kellys cornish ice cream yum! Vanilla ice cream and honeycomb. Mixed berries and clotted cream. I think I'd top it with clotted cream! I think a bit of whipped cream would work a treat! I'd top mine with a little vanilla ice cream nom nom nom! I'd like it on its own but, if I had to, I'd add squirty cream. A nice big dollup of vanilla ice cream! Chopped bananas and fresh cream! Strawberries and cream - yummy! Pouring cream and raspberries :) Yum!! Caramel sauce I may as well be indulgent. Vanilla ice cream for me! Clotted cream and grated Daim - can never have enough Daim! Honeycomb & cream with toffee sauce. Chocolate sauce and vanilla ice cream. I'd top mine with mint choc chip ice cream for a twist on flavour! It would have to be clotted cream ice cream, lovely. A little bit of double cream poured over. Vanilla ice cream for me. Ooh..I was thinking ice-cream too - maybe a coffee flavoured or irish cream? Fresh whipped cream and raspberries. Loads and loads of cream!! I would top mine with chocolate ice cream. Looks like it would be just fine on its own. Ice cream & chocolate sauce!! With some whipped cream and some crushed Daim bars. Mmmm! A little double cream and nothing else. Daim is delicious. Fresh whipped double cream. I love cream! Mini Daim bars (if you can still get them), yum!! cream, caramel and chocolate sauce! Whipped cream, caramel sauce and sliced bananas. I'd top my Daim with some home made peppermint ice cream. Fresh double cream...and more daim! Whipped cream and some raspberries!